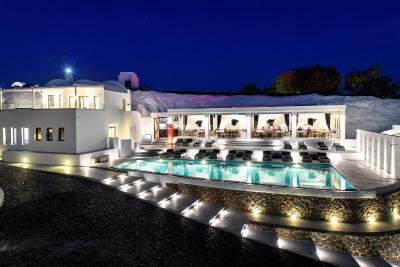 Lock in a great price for Ambassador Aegean Luxury Hotel & Suites – rated 8.8 by recent guests! The location, the view and the pool. The breakfast also is good. Everything. Hotel is unique in its design (be prepared to walk a lot though). Concierge is incredible! Pepi was the best part of the trip. 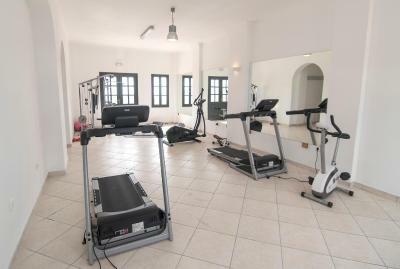 Incredible views and great location away from the crowded city center. Easy to access everything by car from the hotel (definitely rent a car). No accessible beach within walking distance but they make up for it by providing complementary beach beds/umbrellas at a popular beach 10 minutes drive from the hotel. The breakfast was very good. 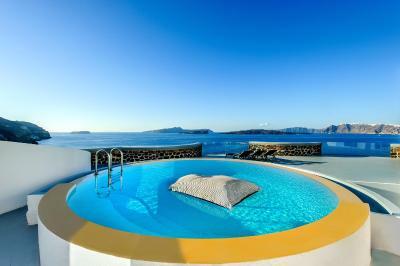 Amazing view from the pool. Very friendly staff. Superb cliff setting with great views, private pools and unique tunnel and cave-like structure. Can see sunset so no need to cram into Oia a few miles away. 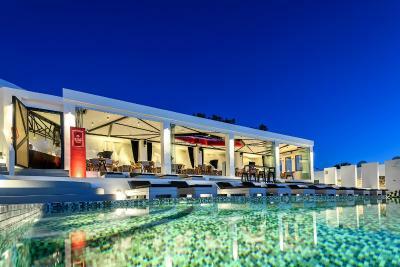 Nice restaurant/bar in Cabo Rosso and not overly expensive for quality of the food. Staff were generally very helpful. Breakfast was good with plenty to offer. Could either order to room, order to have at restaurant or you could just turn up. Overall peaceful but pls see below. The staff are very very very friendly!!! And the area is very peaceful. Amazing service level across the entire staff on the property. Some of the best views I've ever seen in a luxury hotel. 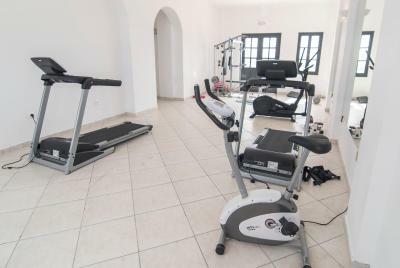 Excellent location, very good property with stunning views of Volcano from the property, spacious private pool. I really loved the service provided by staff especially in the reception with welcome drink. From the moment we walked into check in to the moment we left, we felt special, all the staff were exceptional and there to help. 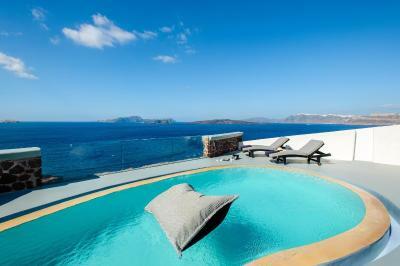 The villa we stayed in was outstanding, with views to die for. Me and my partner had just got engaged, so the staff decided to send a complimentary bottle of wine to our room and made us fee extra special! Would highly recommend this hotel! 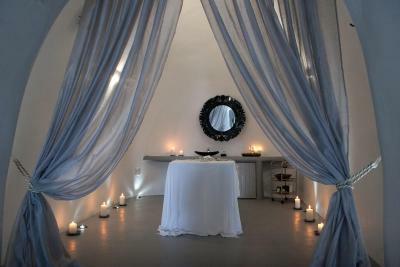 Everything about it was luxury, staff were so lovely and would do anything for you! 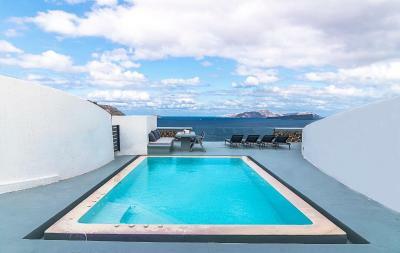 Ambassador Aegean Luxury Hotel & Suites This rating is a reflection of how the property compares to the industry standard when it comes to price, facilities and services available. It's based on a self-evaluation by the property. Use this rating to help choose your stay! 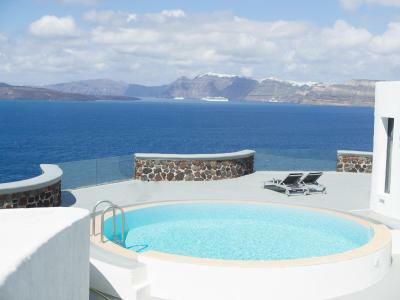 Enjoying panoramic views of the volcano and the Aegean Sea, the 5-star Ambassador Santorini Luxury Villas & Suites features elegant accommodations, each with a private pool. With respect to the local architecture, it blends modern with traditional elements. With vaulted ceilings, arches and built-in beds, all rooms, suites and villas at the Ambassador are tastefully furnished and decorated. Surrounded by a terrace with lounge chairs, each private pool has hydro-massage jets for relaxation. A flat-screen TV and DVD player are included. Guests can start their day with a breakfast from the menu, served in the room or by the pool. 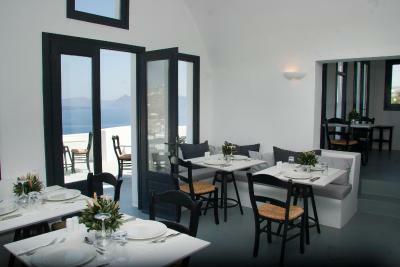 Greek and Mediterranean dishes are prepared at the stylish restaurant for lunch and dinner. Refreshing cocktails and snacks can be enjoyed at the pool bar. Modern lounge chairs and outdoor showers are available in the main pool area. 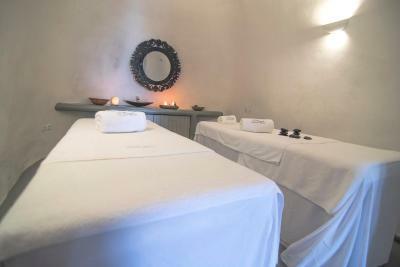 Guests can also choose from several treatments and therapies from the spa. Free Wi-Fi is available throughout. 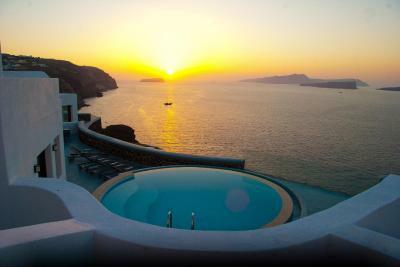 Ambassador Santorini Luxury Villas & Suites is 1.5 miles from Athinios Port and 6 miles from Santorini Airport. 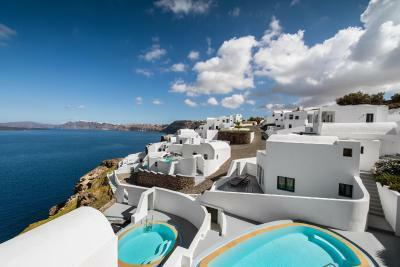 The lively town of Fira is 3 miles away. Free, private parking is available on site. 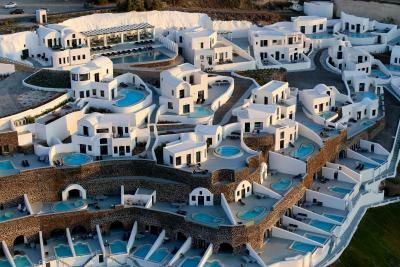 When would you like to stay at Ambassador Aegean Luxury Hotel & Suites? 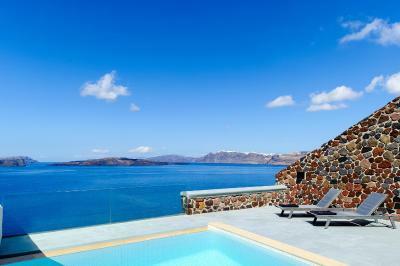 Featuring panoramic views of the volcano and a private swimming pool, this villa offers absolute privacy. 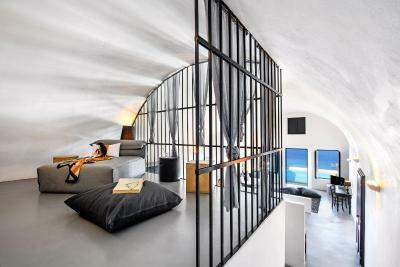 It can accommodate up to 14 guests. 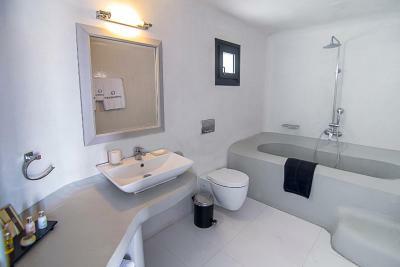 Featuring its own private swimming pool and jetted tub, this elegantly decorated suite is equipped with modern and classical furnishings and high tech amenities. 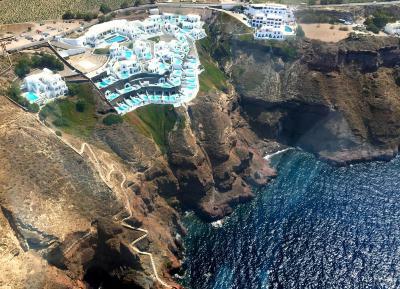 Ambassador Santorini Hotel, an enclave of luxury and romance in Akrotiri, one of Santorini's least exploited areas, is located just a few minutes from the famous ancient settlement that attracts thousands of visitors every year. 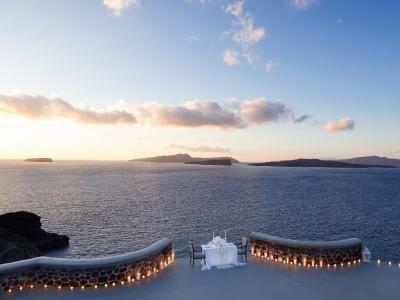 The ultimate Santorini escape: a cool haven of barefoot luxury and pleasure that consists of breathtaking vistas, exciting architecture, sophisticated interiors and impeccable service. 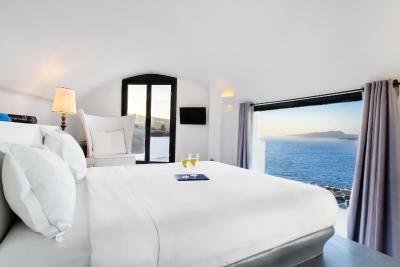 Each of this Santorini hotel's 40 vaulted rooms, suites and villas boasts ample spaces, a private pool and will enthrall guests with front row seats to the island's world famous sunsets, as well as great panoramic views of the caldera, with villages comprised of traditional white cube houses scattered along the cliff's edge. 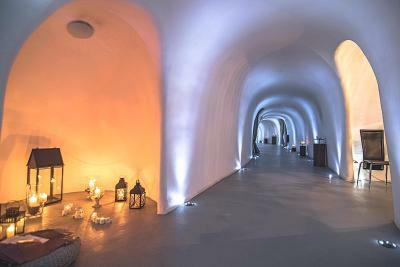 Guests may unwind and enjoy invigorating therapies at this Santorini hotel's sensational spa, explore the gastronomic wealth of the island's local cuisine at the resort restaurant or spend unique moments of total bliss marveling at the sunset and sipping on refreshing cocktails at the elegant pool bar. The private helipad or the electric cars available for guests who wish to move around the villas and the property effortlessly. 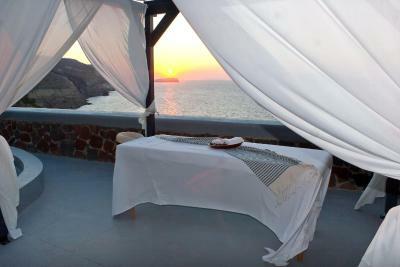 House Rules Ambassador Aegean Luxury Hotel & Suites takes special requests – add in the next step! Ambassador Aegean Luxury Hotel &amp; Suites accepts these cards and reserves the right to temporarily hold an amount prior to arrival. Ambassador Aegean Luxury Hotel & Suites accepts these cards and reserves the right to temporarily hold an amount prior to arrival. Main door wasn't able to lock, floor was really wet even after checked in after 10 hours, but this isn't a major issue. I honestly can not think of anything that I did not like. 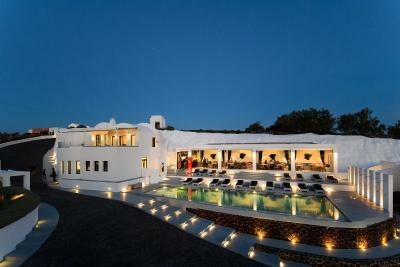 The staff were amazing, Pepi, Alexandra, Catherina they were all absolutely amazing. Specially with the local knowledge and brilliant advice. The rooms were always clean, every staff had a smile and couldn't do enough to help, the view was breathtaking. Not a 5 stars hotel. Rooms and restaurant are average and I have not been able to stay on the terrace because of windy conditions for 6 days. What an amazing place !! We got married on our balcony during their peak season but the staff were so attentive to our needs, Christina was a god send in helping organise the whole thing, from paperwork to flowers and even the celebrant. 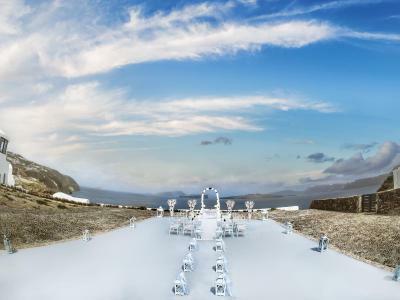 The hotel is beautiful and you have the most amazing view from any vantage point. It is a long walk through the cave like entrance to get to your room but we found it added to the anticipation of the room reveal (from which we weren’t disappointed at all). I highly recommend this place to who ever will listen. Area for improvement would be an upgrade of fitness area. This is not in line with rest of facility and exclusivity. I didnt like the long tunnel you have to go through to reach your room. It's uncomfortable and it gives a sense of going deep down to the ground -very unpleasant. The room inside was very "empty" with lack of accessories that would make it a warmer place. I really liked the view from our room. I also liked the staff, they were very friendly and helpful. the food was good as well and the location was perfect. Soft drinks are way overpriced and there is a silly fee to get breakfast sent to your room, otherwise nothing bad to say. Heads up though pool is not heated so don't expect to swim in it if you visit outside of the peak summer season. Wifi range and speed is a big disappointment. For the amount that we paid, it would have been nice to have at least a bottle of water included, as most of the hotels are doing it. The prices at the minibar was ridiculous. Some additional charges and taxes that we were not aware of. To go to the room and back its a pain. The access to the room its trough some tunnels underground, by the time u go out, you are dead tiered. I wouldn't say all this justify the huge price. Main pool very small. Location ok but 20 min drive to Fira and about 40 to Oia. Not much around in surrounding area. The downside to the cave like structure is noise travels and echos. We were often woken in the night. Once by drunk arguing neighbours at 3pm (guess it can happen anywhere) but also just by people returning to their room late. Was disappointed staff didn’t deal with the aforementioned issue which lasted 90 minutes. Worth mentioning this hotel is not for the infirm. Has some very steep slopes (probably 1:4 gradient in places) and plenty of steps. Overall on the expensive side weighing everything up.